The first of the month means the second in our series on seasonal produce, once again giving you top tips on what to buy right now so that it’s at its best. We’ve teamed up with Miss Magpie Spy to bring these to life and have sourced our fruit & veg from Rushton’s Greengrocer, which provides fresh daily fruit & veg to London’s restaurants and bars. All of the illustrations feature gorgeous plates that are currently on sale in various retailers, just click on the link below each image. 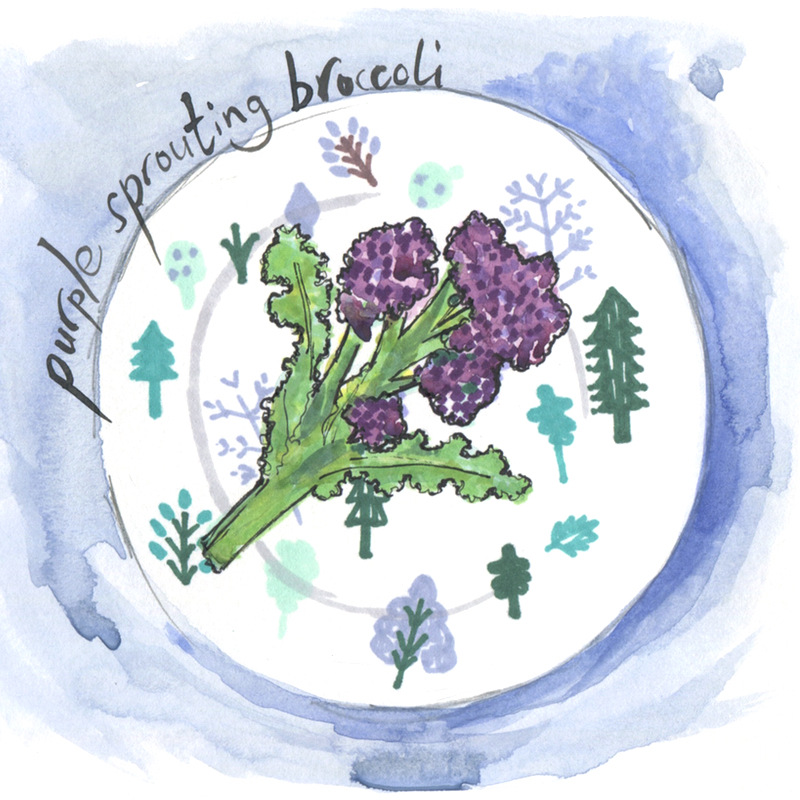 This month’s theme is trees, and the purple sprouting broccoli one is our favourite yet! What is it? Purple sprouting broccoli was initially cultivated by the Romans, but while broccoli itself has been grown in the UK since the early 18th century, it’s only risen to prominence again in the last 30 years. How do they taste? While we wait for asparagus season, purple sprouting broccoli fills the gap with its long-stemmed sweet and tender green stalks. Buying tips? Purple sprouting broccoli is especially good when young, so buy this month! Look for darkly coloured specimens with crisp stalks, no bigger than 1cm in diameter, which snap cleanly when broken. Reject bendy broccoli. What is it? 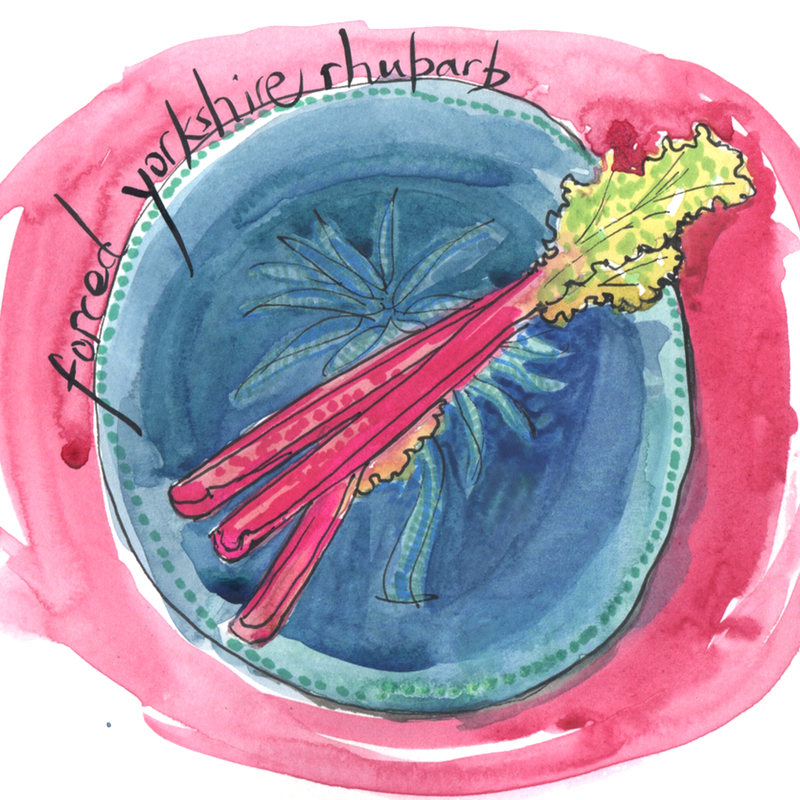 Even though rhubarb is a native of Siberia, it thrives in the wet, cold winters in Yorkshire. Unlike purely outdoor varieties, forced roots are grown in fields for two years before being moved into forcing sheds after the November frosts. They are then grown in complete darkness and harvested by candlelight to avoid photosynthesis turning them green and tough. The ‘Rhubarb Triangle’ is a 9-square-mile triangle in West Yorkshire, and with only 12 growers left has been granted regional product status (like Champagne) by the EU. How do they taste? Depriving rhubarb of light makes the stems shoot upwards, searching for light, which makes for a more succulent-tasting rhubarb. Unlike sturdier outdoor-grown stalks, delicate forced rhubarb has an elegant sourness. How do you cook them? Because the rhubarb is forced, it needs only light cooking – but it does need tempering with sweetness. I don’t think you can go wrong with baking it simply and serving with a crumble & custard. Jackson Boxer’s recipe for The Guardian here does this simply, knocking all the cliche out of it. What is it? ‘Cavolo nero’ is also known as black kale or black cabbage and originates from the fields of Tuscany where it was first believed to be grown in 600BC. 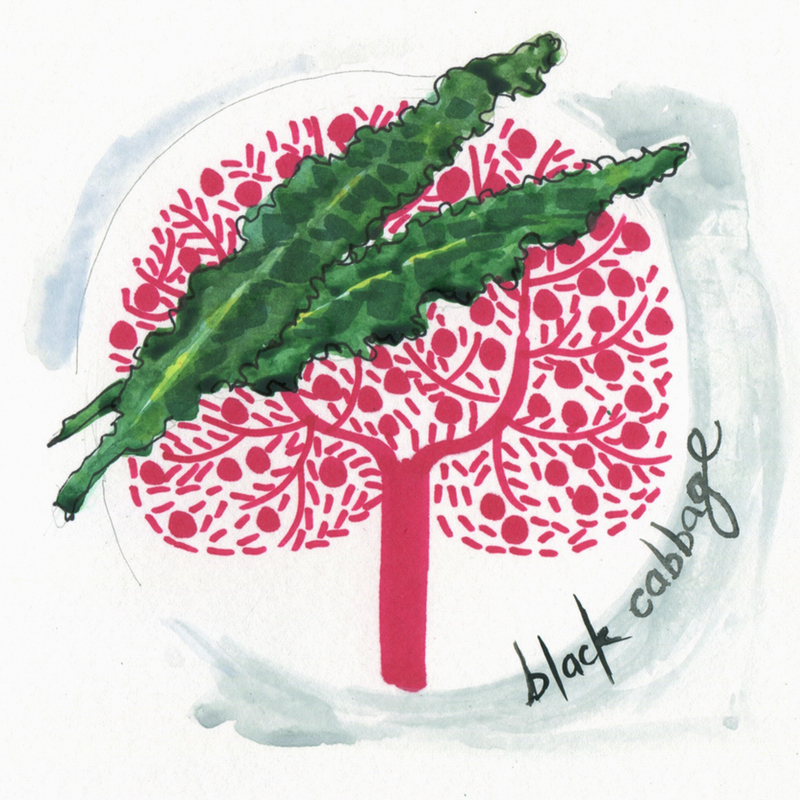 The black cabbage variety is longer stemmed and darker in colour than classic curly kale. The good news for kale lovers is that cavolo nero is now being grown in Lincolnshire, renowned for its fertile, loamy soil and where so many of our home-grown vegetables come from. How do you cook them? Like most cabbage, if overdone, the flavour is destroyed. The black variety is a little hardier than its cousins, so requires more cooking time. Best thing to do is simmer for about 15-20 minutes with some other big flavours. I love this rosemary and chilli version from Sophie Grigson, which you can serve alongside chicken or on bruschetta. Buying tips? Avoid leaves with tears and blemishes, make sure the leaves are long and thin. What are they? 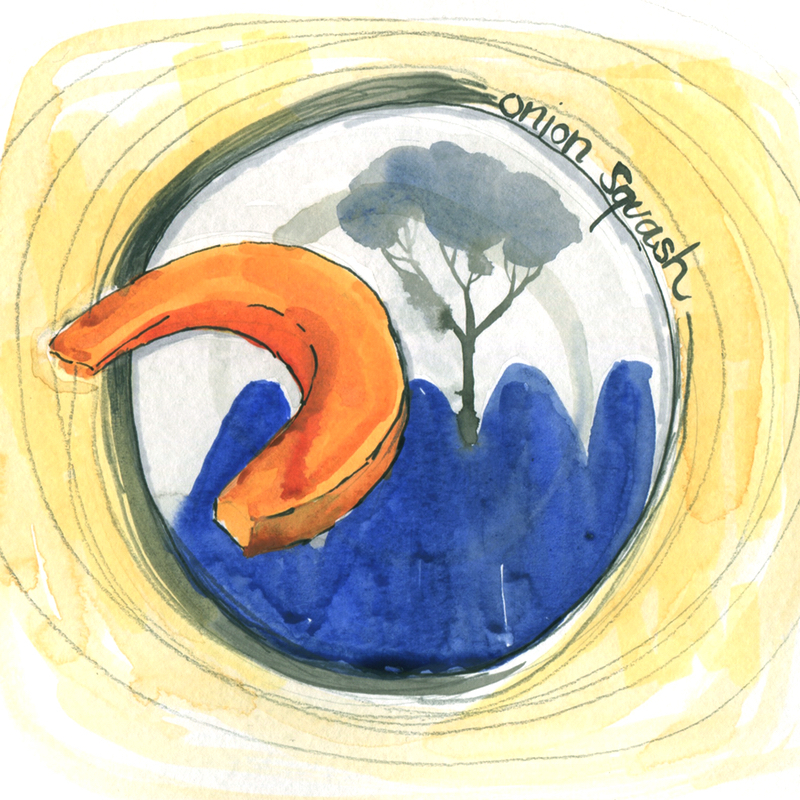 The onion squash is so-called for its shape, but its official name is a red kuri squash. A member of the gourd/squash family, it’s easier to prepare than most because it doesn’t have such a tough skin, and is typically the size of a BIG cooking apple or an oversized Jaffa orange. How do they taste? As the name suggests, it does have an onion flavour to it. Inside the outer skin there is a soft but firm flesh that provides a deep, mellow chesnut-like flavour. How do you cook them? Boil chunks for 8-10 minutes or roast for 40-50 minutes at 200°C. The beauty is that you don’t have to remove the skin, so you get a similar taste as a butternut, but none of the hassle. Ideal for roasting alongside butter and garlic, like this recipe from Blanche Vaughan, or used in soups or risottos. What are they? Discovered in 1952 as a chance seedling growing in New Zealand. The parentage of Braeburn apples is unclear, but both Lady Hamilton and Granny Smith apples were growing on nearby trees. 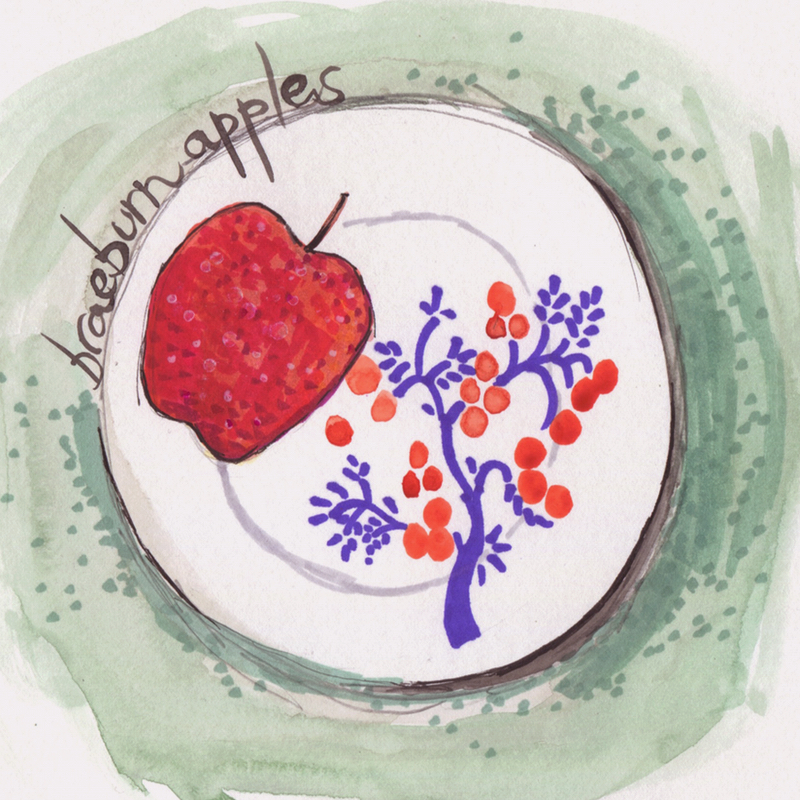 The apple is named after Braeburn Orchard, where it was first commercially grown. How do they taste? A sweet-tart apple, with a crisp flesh that’s creamy yellow and juicy. How do you cook them? Considered to be one of the best apples for baking, you could use in any number of pies, crumbles, pastry dishes and stews. I actually prefer to eat in a savoury dish, like a salad of beetroot and goats cheese. The Guardian maps out a whole range of such dishes, including the salad mentioned here. Buying tips? Like most apples, avoid bruises and breaks to the skin. Braeburns are bi-coloured, so look for this when selecting.